ST. GEORGE – Consider that the only thing between you and an $8 monthly power bill is a set of solar panels. It is time for every home and business to consider the developments in solar energy technology, Justin Munk of Intermountain Wind and Solar said, and the significant financial benefits to consumers. For years, people have been interested in solar but have been discouraged due to the high upfront costs. As technology has advanced however, and green energy initiatives have been implemented, this is no longer an issue. One initiative that Intermountain Wind and Solar provides is the Intermountain Community Solar Initiative. The goal of the initiative is two-fold, one, to educate those that are interested in solar through free workshops, and two, to provide a bulk purchase to help bring down the costs of installing a solar system. Over the next two weeks Intermountain Wind and Solar will hold six free workshops in St. George, Hurricane and Cedar City, schedule provided below. These workshops will cover the basics of solar and clear up a lot of the common misconceptions about solar. Perhaps most enticing to consumers is the freedom that solar energy gives to consumers. For him, the benefit is expressed each month when he opens his electricity bill. “I’m averaging a little less than $8 a month,” West said. And though the installation requires an upfront investment, “it pays itself off in a matter of time,” he said. Even large corporations are investing in solar. There are many businesses in Utah who are converting to solar power, Munk said. 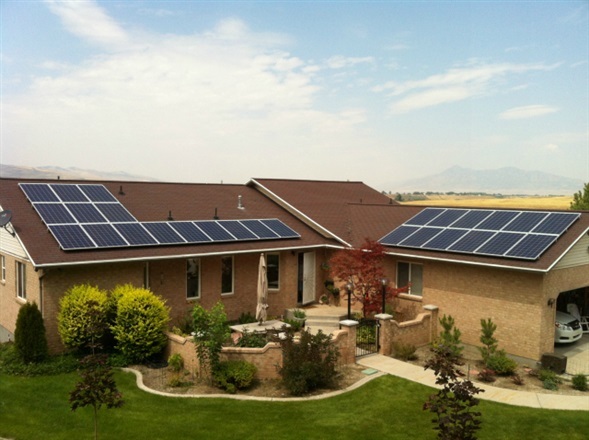 Intermountain West Solar has installed systems for eBay, Inc., a Fortune 500 company, and Ikea in Utah. More local, Intermountain West Solar has installed systems for Dixie State University, Southwest Applied Technology College, and Ivins City. Note: November 22 is the registration deadline for the bulk purchase. Wow…so an ad within an ad. Sneaky.